There’s something a little intimidating about making homemade pancakes. Maybe it’s the fact that a box of pancake mix costs about $3 and is super easy, consistent, and doesn’t really require measuring cups, or the fact that first thing in the morning I’m just waiting for the caffeine to kick in and the last thing I want to do is read a recipe. But weekends…oh, weekends. 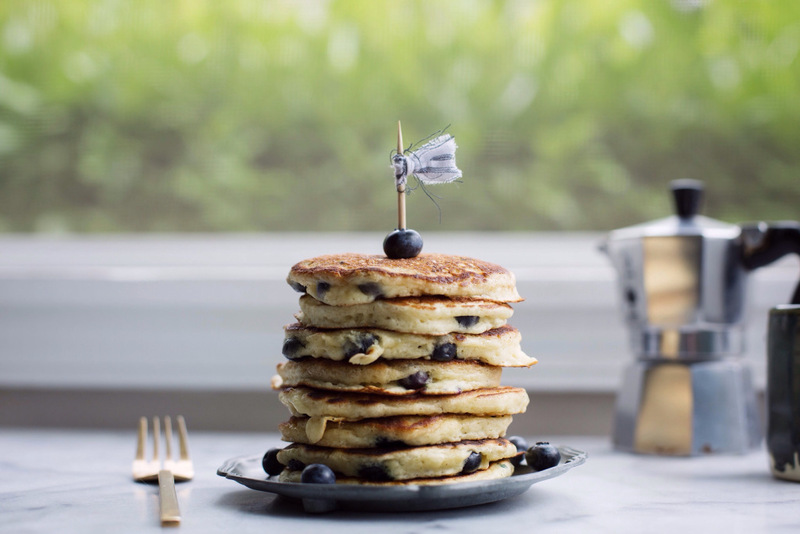 Weekends are for homemade pancakes. I adapted this recipe from a 1940’s edition of A Woman’s Home Companion cookbook I picked up at an estate sale, and it was stuffed full of cutouts from magazines, hand-written recipes, and previously belonged to Mrs. John H. Barth. The original recipe is delicious, the only reason I changed anything is because I really wanted buttermilk pancakes. 1. Pre-heat cast-iron pan or griddle on low-medium heat. 2. Mix lemon juice or vinegar into milk (if not using buttermilk) and set aside while you measure your ingredients. 3. Whisk or sift flour, baking powder, baking soda, salt and sugar together in a medium bowl. 4. Combine egg and buttermilk. While stirring, slowly add egg and buttermilk mixture to dry ingredients, stirring just till combined. 5. While stirring, slowly add melted butter and stir just until you have small-medium lumps, do not over-stir or your batter will be tough. Depending on the thickness of your buttermilk, you may need to add a little more, but the batter should be pretty thick (it looks a little more like cake batter). 6. Very lightly grease your pan with butter. Pour about ¼ c of batter into the pan, drop a handful blueberries (if using) into the poured batter and gently press in. Cook until edges are dry and large bubbles are forming but not popping in the center. Flip and cook till golden brown, a minute or so. Don't worry if a little wet batter spreads when you flip the pancake, it makes for some deliciously crunchy edges. 7. Keep warm in 175 degree oven (I wouldn't keep them in the oven for more than 20-30 min) or tent plate with foil and serve.